When I got back from the market on Tuesday, Rachel my maid was helping me to sort out the veggies and fruits. She found some beetroot in the basket and just sighed and said in kiswahili that this lady loves beetroot, she buys it every week. I find adding beetroot to salads a great idea and my hubby and I both love them. 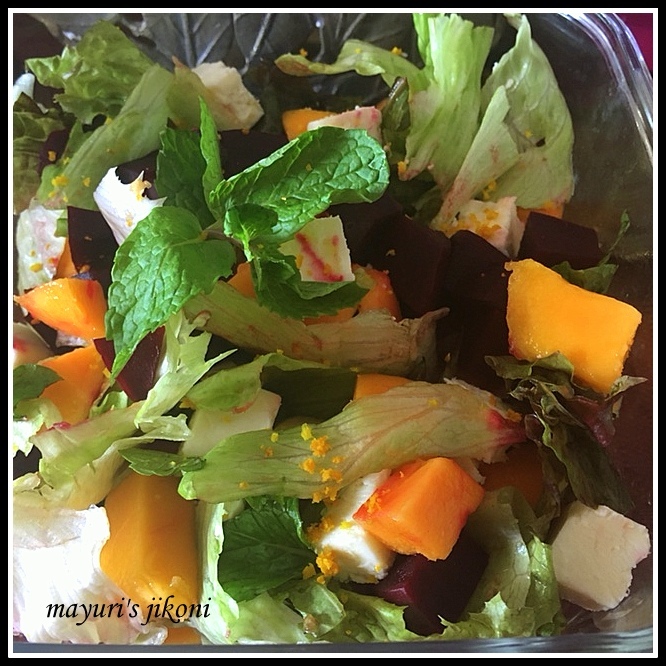 For the salad recipe given below, I added boiled beetroot to mango and to offset the sweetness from both, I added feta cheese. Colourful and appetizing. Before I blog the recipe all my followers out there, please please please take some time to add comments to the recipes you have tried out. Please put them on the blog and not just on facebook. When I am browsing on other blogs, the comments like yummy, looks great, colourful etc are actually not an incentive for me to try out the recipes. I actually look for comments where someone has tried out the recipe and described their experience. Lets make the blog more interactive and encouraging for others. Without your valuable comments I am not achieving one of my goals which is to make cooking easy and delightful for the younger generation. Layer the green leaves all over the serving bowl. Add mango, beetroot and feta. Top it with mint leaves. Tear the leaves into bite size if they are too big. Add baby spinach if you want. Use fresh ginger, as it sort of adds an extra zing to the salad. Since the beetroot and mango are sweet, I didn’t add any honey. Use paneer instead of feta cheese. Just add an extra tsp of lemon juice to the dressing. Just one problem – love reading the recipes but don't manage to put the reading into practice much. Will try and pull my socks up!